The ÚĽUV Design Studio in Bratislava presented the work of prominent Czech designers who have won recognition abroad – jewellery designer Jiří Belda, designer and lecturer Daniela Piršč and Zdeňek Lhotský who has popularised the Czech glass at the international scene. Daniel Piršč (1966) exhibited porcelain sets, a lamp and vases. In addition, Daniel displayed visually unique porcelain sculpture Tiger that had been a representative artwork for the Czech Republic at EXPO Shanghai 2010. Daniel is the artist who has significant impact on the contemporary art through his work with porcelain which he has, through 3D wallpaper, transferred into entirely new context. Jewellery designer Jiří Belda (1958) has built on tradition represented by his father and grandfather Ladislav who founded a jewellery-making company back in 1915 in Turnov. After the events in 1989, Jiří Belda has revived the company (that was seized and ruined by then-communist party) and the activities in this sector. He is also active in designing and hand-made production of small metal objects, timeless cutlery sets and jewellery inspired by Alfons Mucha designs. At the exhibition in the Design Studio ÚĽUV, Jiří Belda exhibited embossed bowls he had already presented at the Paris furniture fair in 2010. Zdeněk Lhotský (1956) has formed the Lhotský Pelechov Studio of fused glass sculpture in the town of Železný Brod in the northern part of Czech Republic, which is the one of its kind in the world. The author is engaged in the production of limited editions of bowls, dining glass containers, vases, wash-basins, small glass design items as well as large glass bowls (150 kg – one piece), artistic glass sculpture and glass for architecture. Lhotský has presented the new glass melting technology Vitrucel in Bratislava. 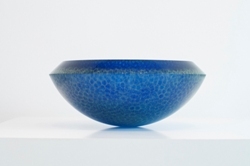 He has displayed the bowls of various colours which this top-quality technology enables to produce.